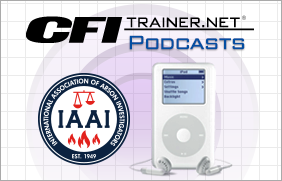 Welcome to this edition of the IAAI’s CFITrainer.Net podcast. Today, we’re exploring a topic that many of us are aware of, but we don’t talk enough about it. We know that leadership and many experts are talking a whole lot these days about cancer prevention. Fire investigators know on an intellectual level that they’re exposed to many hazardous substances on the job as a result of the processes of pyrolysis and combustion, especially when synthetic fuels are involved. Research from at least as early as 1996 when ATF participated in a health hazard evaluation in cooperation with the National Institute for Occupational Safety and Health, or NIOSH, found that fire investigators were exposed to irritants that can cause acute illness as well as carcinogens that can have chronic, long-term effects. Substances including formaldehyde, acetaldehyde, acetone, benzene, xylene, styrene, naphthalene, and compounds like those in cigarette smoke found to cause lung cancer were all present at fire scenes. Furthermore, a large 2014 NIOSH study of 30,000 firefighters over many years found excess cancer mortality among firefighters for all cancers, particularly digestive, genitourinary, which includes kidney, bladder, and prostate—and I hope I’m saying that right—oral, respiratory, and mesothelioma. A 2013 study of white male ATF investigators who self-reported bladder cancer in response to a medical surveillance program found that the risk for bladder cancer is significantly elevated in fire investigators compared to those who do not investigate scenes post-fire. There are other studies contributing to the evidence that fire investigators are at higher risk of developing cancer due to occupational exposure to carcinogens. How we translate this known risk into action to prevent cancer is a tougher sell. Exposure to carcinogens over many years can result in cancer at a time in our lives when we want to be enjoying retirement, grandchildren, and travel. Or, in some cases, it can strike even earlier when we are young, with families to raise and careers to build. Fire investigators shouldn’t be sacrificing the future to make a living now. There are actions that fire investigators should be taking every day at every scene. That’s what we are going to talk about now with our guest, Jeff Pauley. He’s chairman for the IAAI’s Health and Safety Committee. He’s also an IAAI CFI and an investigator for EFI Global. Thanks for being with us today, Jeff. Welcome to the podcast. JEFF PAULEY: Thank you very much. ROD AMMON: So, what do we know about increased cancer risk associated with fire investigation as a profession? JEFF PAULEY: A lot of the information that we have has to be extrapolated from the research that’s being done for firefighters. There’s some ancillary work in our field, but a lot of it is done with the firefighters, and we have to benefit from that, but we are working towards doing some of our own research, and I’d certainly like to talk some about that. But the hazards that we experience today are just fundamentally different from the hazards in fire scenes that were around 15, 20, 30 years ago, so we have to have better awareness and better protection. ROD AMMON: Makes a lot of sense. I – and I guess we’ll get into this in a little bit more depth as we go down the road, but materials that are out there. When I was reading some of the compounds at the introduction to this piece, I was having to go look things up so that I’d even know how to pronounce them. JEFF PAULEY: Well, exactly, exactly. The fire scene of today is certainly not the one of our fathers, much less grandfathers. ROD AMMON: So, let’s talk about how the fire investigators are exposed to some of these new compounds and the old ones as well. JEFF PAULEY: Sure. The chemicals that are present at today’s fire scene, whether it’s from household chemicals that are in the dwelling, chemicals used to pressure treat wood. One of the big new ones these days is Teflon. We’re learning more about how bad that stuff is. We find that not only in kitchen utensils but in a lot of commercial electrical wiring and components. So, things just – and there’s a long list of chemicals that are present in today’s fire scene. Over 100 of them are known carcinogens, and there are new studies coming out regularly that are adding to that list, but it’s just a very unsafe environment for today’s fire investigator post fire. And whether you are there 20 minutes after the fire has been extinguished as a public fire investigator or a week after as a private fire investigator or somewhere in between in that timeline, the hazards are real. They are present. They’re generally broken down to gases and vapors and particulates. ROD AMMON: So how are fire investigators – and this might be a little bit redundant but talk about how fire investigators are exposed to these compounds, and you talked about how it happens not only twenty minutes after but two days after, longer. JEFF PAULEY: Exactly. So, as we said, there is the long list of fire-produced gases. The big ones that we know about are carbon monoxide and carbon dioxide, hydrogen cyanide, things like that, but there are just all sorts of other gases and vapors that are present during and after a fire, whether it’s residential or commercial. Just as an interesting aside, kitchen fires contained to just a small area of the kitchen often produce the highest gas readings just because of all the weird stuff that’s in people’s kitchens today from – between the electronics, and we talked about the Teflon on cooking products and utensil and whatnot. And there’s just a lot of stuff that’s out there. So, a short time after the fire is extinguished, these gases are present. Typically, they dissipate over time given the amount of ventilation and a number of variables, but they do dissipate. The problem is, especially in bigger fires where you’ve got a lot of debris, the gas molecules can be down in the debris so when the fire investigator goes in a day after, two or three days after whatever, and starts digging, it’s quite possible that these trapped vapors, gases are being released into the atmosphere. You can’t see them. You can’t smell them. You don’t know that they’re there, but we well believe, based on other research, that they are present and are creating a hazard. And this doesn’t even begin to address the whole issue of particulates, which is a separate yet similar issue. ROD AMMON: Well, just to help me out, when I hear you talking about gases being trapped and then being kicked up, speak to that a little bit more because I always think of particulate. I always think of something floating up and around, and when you were talking, I was thinking ever since I started dealing with you guys, I got the exhaust fan in my kitchen fixed. So, I’m wondering, can you speak a little bit more about the gases versus the particulate? JEFF PAULEY: Well, sure. So, we’ve got this long list of fire-produced gases. We touched on the carbon monoxide, dioxide, hydrogen cyanide, things like that, sulfur dioxides, acroleins, ammonias, formaldehydes , benzenes, I mean there’s just a whole list of these gases. As mentioned, many are known carcinogens depending on concentration, etc., but this stuff is all released during the process of the burning, the pyrolysis, and while many are lighter than air, some may not be, but they can get down into and attach themselves to the fire debris in a large fire. Your debris pile, field, can be large. It can be deep, and as part of the investigative process when you are digging through this pile of debris, if there are gases trapped, and we believe there, and there’s some research that’s getting ready to come about that’s going to help with this, but it’s quite possible that, one, there are trapped gases down in the debris piles, and two, that when you dig, they are being released. And if you’re not properly protected, you are breathing this stuff. You are absorbing it through any unprotected skin, and this can have long-term health consequences for the fire investigators. ROD AMMON: So, I want to get back to what you talked about with research later on, but what should departments do? Just so we get some of this information done right upfront, what should departments do to reduce their exposure or the exposure of their personnel? JEFF PAULEY: One of the issues that we’ve got as fire investigators is that we are often, whether it’s public or private, whether you’re there right after or sometime thereafter, we are at more fires than the average firefighter. And, unfortunately, we are often—not always—less well protected. The Health and Safety Committee issued a white paper this past summer, and we have some handouts that go along with it that addresses the various personal protective equipment that fire investigators should be wearing. And I don’t know how much detail you want to go into that, but you have to be covering yourself to a great extent to limit absorption of these gases into your system. After your lungs, the second-largest organ in your body is your skin, and when you exert yourself and your body temperature goes up, the absorption rate increases. So, it’s important to keep yourself covered up whether it’s a Tyvek suit or clothing that you take off before you leave the fire scene, whatever. There are a number of solutions, but you have to be doing it, and then you have to be wearing proper respiratory protection to mitigate this stuff being breathed into your lungs. There are a number of solutions out there for respiratory protection. Our research and working with the CDC and folks at the – let me make sure I get this right – the National Personal Protection Technology Laboratory. I believe that’s the correct words. JEFF PAULEY: Which is a NIOSH outfit in Pittsburgh. The minimum acceptable respiratory protection for fire investigators is what’s called a P100 OV/AG filter, so that means if you are – P100 essentially means it’s HEPA, and P does not stand for particulate, but 100% of particulates, which is the same thing as a HEPA filter with OV—oily vapors and acid gases. You can have more protections. That’s wonderful, but that is the minimum. These folks that we see wearing an N95 essentially dust mask, that is not acceptable for what we’re doing, and just – those things need to be put away. And if you’re not wearing a respirator that is air purifying with at least that type of filter, then things need to change. ROD AMMON: And I think we both know. I’ve been around for 15, 20 years working around your people and – I shouldn’t say your people, the people in fire investigation and the fire service, and we all know that these changes are not just a little rough to come by. They’re very, very difficult. JEFF PAULEY: Oh, the – changing the culture in any organization I think, one, has to be top down, and two, really takes about five to seven years. Within the fire service, even that is probably an underestimate. We are just a group that is very resistant to change. I can’t explain it. I don’t understand it. My philosophy has always been when we know better, we should be doing better, but there are plenty of people who just don’t ascribe to that philosophy, and that’s what we’re trying to change is the culture. And whether you’ve been doing this a long time or a short time or you’re an old person, a young person, it really doesn’t matter. For the older folks who may have been exposing themselves to what I’ll call bad practices, that we know now are bad practices. We didn’t know it then. They have already done things to their body, but what they can be doing is, one, helping themselves from this point forward, but two, they’re setting an example for the younger folks. So, the younger folks are not exposed to the peer pressure of these old/bad practices. ROD AMMON: That’s a great point. JEFF PAULEY: The younger fire investigators who are just getting into it or who have been into it a short time, the amount of benefit that they are doing to their health and their future health and wellbeing is just amazing by adopting effective prevention practices. ROD AMMON: Makes a lot of sense, and that is a great point. Two things I want to just sort of make sure we remind folks of. One, the white paper that you discussed that the IAAI Health and Safety Committee put together is available I think up at firearson.com in the resource section. JEFF PAULEY: It is, yes. It’s a little challenging to get to, but I’ve heard that the website is going to be worked on to make things a little more user friendly, but yes, there’s a resource page or tab, whatever, and under that is health and safety, and then under that is the white paper. We have some quick facts documents that go along with that paper to highlight certain benefits. One is strictly on respirators, and one is just more overarching on all of the good things that we should be doing to protect ourselves. JEFF PAULEY: That would be great. JEFF PAULEY: I – unfortunately because I have my own copies of the documents, I don’t spend as much time at the website as other people may, but it’s very important that, as you say, the people know where they can go to get the material. And that white paper, 15 pages I believe it is, just covers a lot of territory, and I equate it to 921. It’s kind of the investigator’s bible, how to conduct an investigation, but it’s a guide. It’s not a standard. The white paper is the same thing. It is a guide. It is the best way to do things most of the time, but it’s the first ever document of its kind that outlines and prescribes specific actions and procedures to better protect fire investigators. JEFF PAULEY: It’s good stuff. I’m real proud of the committee’s work in getting that document out over a couple-year period. ROD AMMON: Well, they should be very grateful for the work that you’ve done. I know there aren’t big checks flowing in from that. This is a volunteer thing that you do. JEFF PAULEY: There are no checks flowing in, but whatever. ROD AMMON: Well, no, I think the expertise that comes from a lot of the folks that are members or are not members of the IAAI, part of the overall network in fire investigation, I just always like to say to everybody thanks because a lot of it has – it affects us and what we do in production. If we don’t have good content and good expertise, then the things that we create don’t become meaningful in the long term. JEFF PAULEY: Well, exactly, and one of the assets that our committee has is an advisory panel of subject matter experts in a number of related fields: medical practitioners, medical researchers, CDC, NIOSH staff. I mean it’s just – we can’t do the work without these folks, and it’s just been a wonderful partnership, and these folks just continue to step up and help us in so many ways. ROD AMMON: Well, that’s great to hear, and it’s good to have partners for all the same reasons, trying to get resources and trying to get money and trying to get research. It’s also one of the challenges, getting good data. As you said when we started, just the fact that we have to sort of piggyback on what’s going on with the fire service in general, changes or affects the work that’s being done. JEFF PAULEY: Exactly, which would be a great segue into talking about some research. ROD AMMON: All right, let’s do it. Talk to me about some research. Tell us what’s going on out there. JEFF PAULEY: So, a pending project that I am just tickled with; and we have what we’re calling a handshake agreement. There’s nothing formal yet, but we are working on that, but the ATF lab in Maryland is, in January, going to be burning some structures in their huge, beautiful facility that are then going to sit for a few weeks in preparation, waiting for a training class that they’re putting on in February. So, one of the issues that we have as fire investigators is that there is zero research as to the persistence of these gases and vapors that we’ve been talking about and the particulates, which we’ve talked some about and may want to get some more in on that. But anyhow, there’s no solid research that talks about the persistence of these things in the post-fire environment, so what we’re going to do is ATF is going to burn these various structures. I know there’s more than two or three, but I don’t have firm information how many. But anyhow – then we’re going to instrument them up and take readings over periods of time for days, a week or more, one with them just static sitting there but also with people walking through the scene, which stirs things up, and then digging the scene, which we do as fire investigators, which stirs stuff up more and more and get some data, some good data on the persistence of these things in the post-fire environment. Never has this been done that we are aware of anywhere. So, all of these studies are done in the fire environment, which is great for firefighters, but the stuff does persist, and our guys are going in not wearing SCBA and structural fire gear many times, most times, but much less well protected. So, this is going to give us some great information. ROD AMMON: It’s great once again to have partnerships. JEFF PAULEY: We have known that this needs to be done. We’ve talked with some other folks who said, yeah, that’s great. You get some grant money or whatever, and we’ll consider helping you with it, which is a whole separate issue, but then in really just a chance conversation with somebody who works at the ATF lab and I were doing training together for the Florida chapter down in Tampa a couple of months ago, and we got to talking about this. And I said this is really a huge need that – and he looked at me and he’s like, we can probably do that, and it just went from there. So it’s just an awesome thing, and I just can’t emphasize how good it is, one, to have their help and a good relationship with ATF, but stuff that just has never been done before that we need to do so that we know better, so we can take a lot of the assumptions and hypotheses that we currently have regarding the persistence of vapors. Particulates we know is a problem. Whether you’re there an hour or a month later, particulates are a problem, and you know, it’s funny I had a very senior fire investigator tell me one time here not too long ago that, well, I just take my flashlight and I shine it through the scene, and if I don’t see any particulates, I’m good, so I don’t wear any protection. Well, the particulates you see are typically the ones that your body’s system through the hairs in your nose and the – whatever the things are down in your throat and then the upper part of your lungs, and I’m not a medical person. I don’t know the name of them. I know they’re there. Your body’s natural systems capture and reject these things. It’s the little, teeny, 0.5, 0.3-micron pieces of stuff that you cannot see that get down into the bottom of your lungs and create problems for you 10, 20, 30 years down the road. So, we know those are there all the time, so there’s really very, very, very few fire scenes where respiratory protection is not required. ROD AMMON: It’s funny. You know, I’m sitting here thinking where there’s smoke, there’s fire. And when you take away that smoke, does it remove the problems? Does it remove the harm that you can do to yourself? And what I’m hearing is no. So that’s the scary part about it. JEFF PAULEY: Well, it is, and this is one of the fundamental culture-change issues that we’re dealing with. Do vapors and gases dissipate over time? Yeah. Are they able to be stirred up? We think so. We believe so. We’ll find out, but the universal point is that particulates are there, and they are always there, and just because you can’t see them, smell them, touch them, feel them doesn’t mean they’re not there and that you have to be protected. One of the problems that we have with the younger fire investigators is getting them to understand that the actions today will help them 20, 30, 40 years down the road. It’s kind of like retirement. You talk to a 20-something about retirement and saving for retirement, it’s just a foreign topic to them because it’s so far in the future. We’re dealing with kind of, sort of the same thing because the actions that they take today are going to have an effect on them down the road. We have acute issues, which happen right now. I fall through the floor, and I break my leg. That’s an acute problem, and you go to the hospital and you get a fix, but the chronic ones, those are the ones that it’s just very challenging to get people to deal with because why should I do this today? The scene seems fine, and I can’t – my brain will not think 30 or 40 years down the road for me, and that’s a challenge for us, but we’re working on it. ROD AMMON: When I was 20 years old, I don’t think I was even thinking about breaking a leg or stepping through anything. JEFF PAULEY: Yeah, who cares? JEFF PAULEY: Exactly, exactly, so it just makes our challenge a little more challenging. ROD AMMON: I want to play a word game with you here just to get through some points that I think are very important before we close up. ROD AMMON: And I’m just going to sort of drop something out, and you give me a couple of sentences of what you think people should do so that we can leave with a message here. JEFF PAULEY: It’s necessary 99% of the time. It’s respiratory protection. It’s eye protection. It’s covering your unprotected skin, and you’ve just got to bite the bullet and do it. ROD AMMON: Great answer. Food. JEFF PAULEY: Food – nourishment, good thing when you’re at an extended scene, but if you’re not properly doffing your PPE and cleaning yourself before, you’ve got a problem because all these nice little particulates that you can’t see and don’t know are there are actually there, and they’re sloughing off of your PPE and your skin and getting in your food, and you’re ingesting it. ROD AMMON: One of the notes I had was ask about eating and drinking at a fire scene, and I can imagine when you’re lonely out there in the middle of a fireplace – fireplace – a fire scene that sometimes you’re exhausted after digging. You unwrap a big hoagie or something and sit down, and I think the point there was is, hey, get yourself clear. I think your donning and doffing point, that’s excellent. JEFF PAULEY: It’s, again, culture change. JEFF PAULEY: Decon is huge, huge, and one of the big issues that we’ve got is you get these fire investigators that wear their standard work clothes, whatever that is, a uniform, jeans, and a T-shirt, whatever. They go out. They work a scene. They don’t wear any protective covering over this. They don’t change their shoes or boots out, so they go through, work the scene, which means they’re contaminated. Then they get back in their vehicle, and they drive away, which now has contaminated the vehicle. They go home. They go to the office, whatever, and all of this contaminant is being spread all over the place, which then is affecting, to some level or another, other people. We talk extensively in the white paper about decontamination and the proper process for doing that at a scene as well as doffing your PPE, where to store it, how to store it, and I’ll just give you a hint here. In the passenger compartment of your vehicle or a trunk if you’re in a car is not the right place unless it is properly sealed up. ROD AMMON: And my two next words were going to be disposable and laundering. JEFF PAULEY: Exactly. So, the more disposable stuff you can wear – the Tyvek suits are awesome. I will tell you in the south in the summer, they’re hot as blazes, but they’re effective. They’ve got to come off in a certain way, gloves same thing, but they need to be put into a trash bag, sealed up, not in the passenger compartment or the trunk of your vehicle unless it is properly sealed up, and then properly disposed of. And we see the same thing with firefighters. They go and they do an interior attack. They get back in the cab of the truck still wearing their structural turnout gear, and all of that stuff is contaminated. They are starting to take steps on their end to clean, do a gross decon before they leave, which is awesome, or gosh, stow the gear outside the passenger compartment. So, they’re doing the same things and talking about the same changes that we are. As an industry, we just need to be doing better. ROD AMMON: So, Jeff, ventilation. JEFF PAULEY: So generally speaking, ventilation is our friend. The more fresh air you get into a post-fire scene and the longer you get it, the better it is for the gases and the vapors, particulates another story. They – depending on the scene, it’s hard not to have them, but there can be a couple of scenes where there aren’t any or very minimal, but ventilation is not going to significantly change the post-fire environment when it comes to particulates. It will to gases and vapors. ROD AMMON: How about tools? JEFF PAULEY: So, we use a lot of tools. I carry a lot of stuff with me because I never know what I’m going to need. The public guys can call for additional resources. On the private side, we are more challenged with that, but if you’re not effectively cleaning your tools as part of the decon process, you’re going to have problems because, again, back to the particulates, those are going to be attached to your tools when you’ve been doing digging, and you throw them in your vehicle without cleaning them. Well, what’s that doing? It’s spreading the particulate matter around. Even if it’s in the back of your pickup truck, it’s still sitting there, and then you open up the truck again, and you’re getting exposed to admittedly minute quantities, but the cumulative effect of all these little exposures becomes a big problem down the road. JEFF PAULEY: It’s better just to have good practices. Clean your stuff before you doff your PPE and before you doff your respirator, not after. Clean your tools, and then go through the proper doffing procedure for your PPE. ROD AMMON: And I guess we can end up on these – end this list of things to do with wash your hands and yourself, you know? JEFF PAULEY: Yeah. No matter how protected you are, and you’ve seen the picture on the back of my IAAI business card that’s got everything on that you possibly can have, which there are times when that is all needed. You still have parts of your skin that are exposed. Wipes are great for cleaning yourself at the scene; and then changing your clothes or getting out of whatever you’ve been wearing that is contaminated so you’re not spreading that is all wonderful. But when you get home or back to the office or whatever, one of the first things you need to be doing is taking a shower and cleaning all of yourself. ROD AMMON: Well, I think you’ve put it all together, and I really appreciate it. Is there anything else that you wanted to get out there as a message? We’ve gotten pretty detailed, but I think – I just want to give you this opportunity. If there’s anything you’re looking to communicate, do so. JEFF PAULEY: Well, it – no, we have very nicely covered stuff. As you understand, it’s a subject that I’m very passionate about. I started down this field of health and safety because a mentor of mine who was a long-time fire investigator had a very quick, three-month period from diagnosis to death, cancer that we are all sure was fire investigation related. And one of my big things – I said it before; I’m going to say it again: when we know better, we need to do better, and the more we can do to educate fire investigators on the proper ways to protect themselves, the better life they’re going to have going forward. ROD AMMON: Jeff, thank you very much for your time. Again, Jeff is the chairman for the IAAI Health and Safety Committee and an IAAI CFI as well as an investigator for EFI Global. Hope you have a nice holiday, and we appreciate your time, Jeff. JEFF PAULEY: Thank you very much. It was wonderful. ROD AMMON: For those of you who listened to last month’s podcast, we did a news story about an amazing moment where there was a gender reveal party that basically sparked off the Saw Mill Fire in Arizona. If you go to Google and just search gender reveal fire, you’ll see the actual fire and the explosion that was caused by that party, and we all can certainly hope that these type of things don’t happen in the future and that we’re all a lot more careful about things that can trigger forest fires. We’ve got enough issues out there already. Hope you all keep safe out there. Hope you had a nice Thanksgiving holiday and look forward to the holidays coming up as well. For the International Association of Arson Investigators and CFITrainer.Net, I’m Rod Ammon. Cancer in the Fire Service. Presentation. International Association of Fire Fighters. 2015 John P. Redmond Symposium given by Robert D. Daniels, PhD. Centers for Disease Control and Prevention. National Institute for Occupational Safety and Health. Davis, Susan et al. "Evaluation of a Bladder Cancer Cluster in a Population of Criminal Investigators with the Bureau of Alcohol, Tobacco, Firearms and Explosives—Part 2: The Association of Cancer Risk and Fire Scene Investigation." Journal of Environmental and Public Health. Volume 2013. Donahue, Michael L. Occupational Safety & Health Programs for Fire Investigators. Fire Engineering. 1 June 2006. Accessed 1 Aug 2018. Firefighters and Cancer. National Fire Protection Association. How One Fire Department Build a Cancer-Prevention Plan. Fire Chief. 7 May 2017. Occupational Cancer in the Fire Service. National Fallen Firefighters Foundation. May 2015.